The Bailiwick of Guernsey is a great place to enjoy birds, flowers, rocks and history. 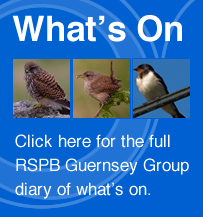 The Guernsey RSPB welcomes both members and non-members and runs an active programme of walks, slide shows, boat trips and fundraising activities. The scenery is superb, not only on Guernsey but also on nearby Herm, Sark, Lihou and the northerly island of Alderney. All the islands act as fuelling stations for wintering waders and passage migrants, whilst the resident tree-creepers are short-toed and the wagtails mainly white. The flora also has a continental flavour and the rocks are colourful and old! We have over 1200 national members in the Bailiwick and over 200 are involved in the local group. We support local conservation issues, as well as raising funds for the national body. Apart from continually seeking to increase public awareness of birds and the environment, we aim to enjoy ourselves. Locals and visitors are very welcome to join in the fun. Contact any committee member or just turn up. If you want to know more about the Bailiwick and its life check out the local links on the “Links page”.